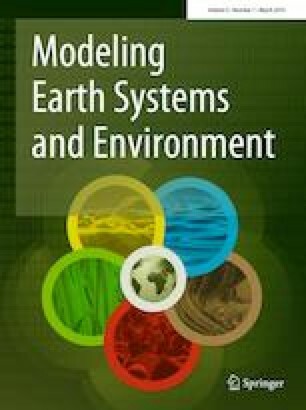 A critical foundation for empirical land change modeling is the mapping of transition potentials—quantitative evaluations of the readiness or suitability of land to go through a transition. This paper presents a procedure based on empirically determined normalized likelihoods of transition. It shows that these normalized likelihoods equate to posterior probabilities if case–control sampling is carried out among historical instances of change and persistence. The posterior probabilities can then be aggregated at the pixel level across multiple covariates using linear opinion pooling where the pixel-specific weight for each covariate is determined locally by its ability to distinguish between the alternatives of change or persistence. Thus, covariates with spatially varying diagnostic ability can be productively incorporated. The resulting algorithm is shown to have a skill comparable to that of a multi-layer perceptron approach with the advantage of high efficiency and amenability to distributed processing in a cloud environment. The online version of this article ( https://doi.org/10.1007/s40808-019-00584-0) contains supplementary material, which is available to authorized users. This research was conducted as part of a grant from Esri Inc. to develop a cloud-based implementation of Clark Labs’ Land Change Modeler. We are very grateful to Esri for this support.